Adjustable Transfer Bench eliminates the need for a person to step over the side of a bathtub or shower ledge, making it easier and safer to get in and out. 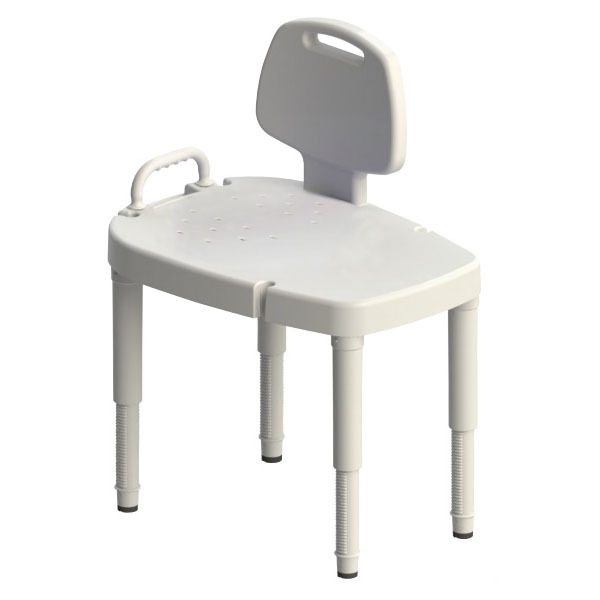 It has a long seating surface and is positioned with two legs in the tub and two legs outside. This allows the user to sit down on the portion of the seat that is outside and safely transfer across the seat into the inside of the tub. It is ideal for anyone who has a lower extremity injury or a disability that prevents weight bearing on the legs. Sliding feature enables a person to smoothly move across the bench with little effort and reduces stress on caregiver’s back by making it easier to maneuver a person. Rotating swivel top allows for easier transfers and greater accessibility. Bench top surface: 30" x 20.5"
Height adjustable from 16" to 23" (40.6cm to 58.4cm). Legs can be easily adjusted in 1⁄4" (0.64cm) increments. Identification markings make adjusting all legs to the same height simple. Legs, back and arm are removable for easy storage and transport. Non-skid feet hold seat securely in place. Built-in soap tray, shower spray holder and slit for the shower curtain. All plastic construction will not rust.